Well phew, the large centre compass is finished. It took me longer then I planned and hoped due to a number of factors. Primarily my clever plan of quilting the smaller compasses backfired big time. Instead of being able to squish the quilt under the throat, due to the heavy quilting on the smaller compasses it was very difficult to manage and really impacted my ability to manage any intricate quilting on the large compass. So I fell back to the old standard. Pebbling on the rumbas, large and small stippling on the large compass points, Leah's Wiggly Tentacles on the smaller points and then used half of the Leah's Wiggly Woven Lines and Leah's Deco Leaves which I think worked quite well. I also had issues with bunching as I quilted sections close together, nothing I can do but quilt them flat. I was tempted to be disheartened and feel like I had ruined the quilt due to rushing, quilting sections without thought for how it would impact the rest of it and so on. But I'm choosing to take this as a huge learning by doing experience. This is my quilt and not a gift for someone else so I can chill a bit about quality and basically I'm getting a lot of quilting practise under difficult circumstances. I'm delighted to be able to focus on the next sections, decorative quilting which should be easier to manage as they are along the sides so I'll be able to keep the majority of the quilt to the left of the needle and not stuffed under the throat. I'm also looking forward to using lots of Leah's water/sea quilting patterns to fill out the rest. My machine is going to the doctors tomorrow for an overhaul while I'm in Macau for work, so we'll both come back refreshed and ready for the next section of quilting. 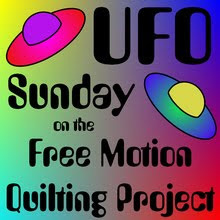 What I have realised is that for me having a quilt sitting around as a UFO means that when I come to quilt it, I already feel like that project has been around for ages and feels behind and a bit stale. I'm really looking forward to starting a project from scratch and seeing how the quilting feels. I had wanted to do two large nap quilts for family for Christmas, but as I have to post them by middle of December if I don't start now then I won't be finished in time. I really don't want to put Compass on hold. I just feel strongly that I must finish it completely and not get distracted by something else. So I've decided that these quilts are going to be Valentine Day presents, both are single ladies so I think that will be a lovely surprise and I won't be pushing to get them done for a very close deadline and having a quilt half finished waiting for them to be finished. I have to say it feels very good to have made that decision and not fall back into the old ways. So all in all the Compass isn't proving to be the showcase of my quilting abilities that I had always fantasised about, but boy is it proving to be a complete blessing and teaching tool about myself, overcoming adversity and simply just doing and not procrastinating. I have a feeling this is a quilt I will pull out on bad days, when life seems to be going wrong or not working out how I had hoped and I'll be able to lie underneath it and reassure myself that a quilt is layers of fabric held together by stitches and is not about quality or perfection, but warmth, colour and effort, just like life. Again many thanks to Leah for keeping me on track. Good for you! I think your project is amazing but I totally understand your frustration. I'm learning on each UFO I finish too and haven't even started FMQ yet! I love it!!! Its beautiful, the top and the quilting. I have several quilts that were going to be perfect, and then things happen along the way. So now I look at them and see my own progression. How the quilts made now are better then the ones made 5,10 or 20 years ago. I smile, and remember where I was then, what my ability was, and what I've learned along the way. Thank you for sharing. I do think it still counts as a masterpiece. I think it looks fantastic. Congratulations on taming this beast! I have made many quilts that started out with the intent to be perfect, and then something would happen along the way. So now I look at those "mistakes" and smile, and think about where I was at the time, and how far I have come since then. This quilt is beautiful, and you should still consider it a masterpiece. Get the rest of the quilting done, and the tucks will hardly show. Yes, there are flaws, but next time you will know how to do better. Thank you everyone for your kind words. I'm already looking at the Beast fondly now and enjoying the mistakes - onwards and upwards. And I'm really looking forward to the next stage. B, I know for sure that we humans/quilters are WAY to hard on ourselves. I look at this center and I see nothing but beauty! You've done a fantastic job on it -- really! Keep up the good work -- you're working wonders ! What a wonderful way of looking at your experience with this quilt! Yes, you will definitely enjoy sleeping under it! We are hard on ourselves aren't we. Collecting my machine tomorrow, can't wait to get working on the edge sections. I am also treating my current project as a learning process. And it does help when things are less than perfect to do that, doesn't it. Your project is beautiful and amazing. Looks like you have learned a lot doing it. My hubby has ALWAYS told me there is no such thing as a perfect quilt. I stand by that!!!! I do the best I can and take the opportunities to learn as I go. What a wonderful journey... Your quilt is stunning!